On the centenary of the end of First World War, Academy Award-winner Peter Jackson (The Lord of the Rings trilogy) presents the World Premiere of an extraordinary new work showing the Great War as you have never seen it. Using state of the art technology to restore original archival footage which is more than a 100-years old, Jackson brings to life the people who can best tell this story: the men who were there. Driven by a personal interest in the First World War, Jackson set out to bring to life the day-to-day experience of its soldiers. After months immersed in the BBC and Imperial War Museums’ archives, narratives and strategies on how to tell this story began to emerge for Jackson. Using the voices of the men involved, the film explores the reality of war on the front line; their attitudes to the conflict; how they ate; slept and formed friendships, as well what their lives were like away from the trenches during their periods of downtime. Jackson and his team have used cutting edge techniques to make the images of a hundred years ago appear as if they were shot yesterday. They Shall Not Grow Old was released on Cinema 123d ago in the US and the UK. Notify me when They Shall Not Grow Old is available. Based on 8 They Shall Not Grow Old reviews, They Shall Not Grow Old gets an average review score of 91. Giving a remarkable 3D makeover to archival First World War footage, Peter Jackson's first documentary is a technical dazzler with a surprisingly humane streak. 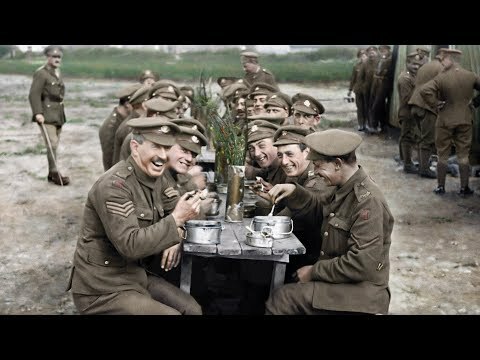 Drawing on a vast film and audio archive, 'Lord of the Rings' director Peter Jackson brings the Great War vividly back to life in this innovative colorized documentary.